Proprietary Name: Mucus Relief Extended Release Maximum Strength What is the Proprietary Name? Non-Proprietary Name: Guaifenesin What is the Non-Proprietary Name? 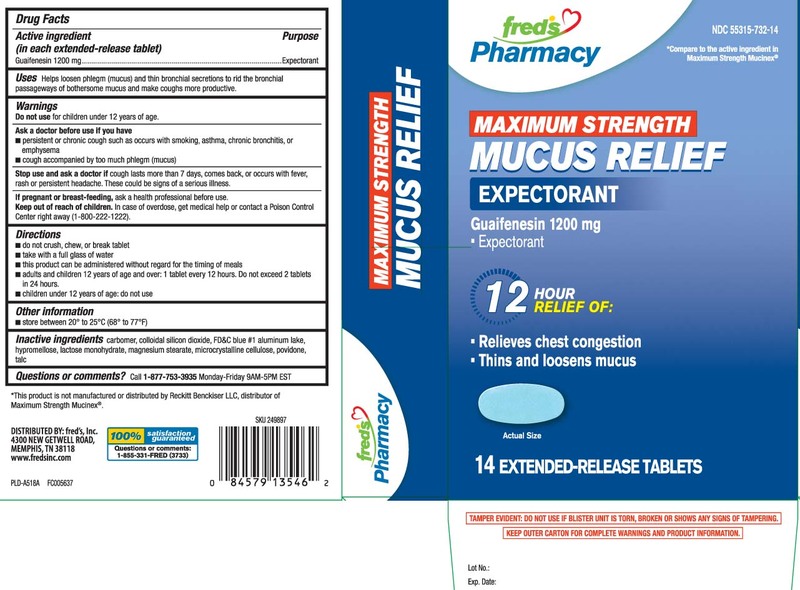 Mucus Relief Extended Release Maximum Strength with NDC 55315-732 is a a human over the counter drug product labeled by Freds Inc. The generic name of Mucus Relief Extended Release Maximum Strength is guaifenesin. The product's dosage form is tablet and is administered via oral form. FDA Application Number: ANDA207342 What is the FDA Application Number? Helps loosen phlegm (mucus) and thin bronchial secretions to rid the bronchial passageways of bothersome mucus and makes coughs more productive. Cough lasts more than 7 days, comes back, or occurs with fever, rash or persistent headache. These could be signs of a serious illness.